Mosaic datasets consist of three layers: boundary, footprint, and image. The footprint layer shows the extent of each item in the mosaic dataset as a distinct polygon. The footprint attribute table is the catalog of all the images in the mosaic dataset in addition to any associated overviews. In this table, you can sort your imagery based on any of the attributes, such as cloud cover, acquisition date, or any of the sensor characteristics. The boundary layer shows the extent of all the raster datasets in the mosaic dataset as a single polygon, which is multipart if your collection of imagery is not contiguous. The image layer controls the rendering of the mosaicked image similar to a raster layer. Display and rendering properties, such as stretch, band combination, resampling, and mosaic method, are modified on this layer. On the Data tab, you have options for selecting the specific layers with which you want to work. If you have a collection of images over a city that comes from a variety of sensors taken at different times of the day on different dates, you can make a selection based on any of these characteristics, also known as querying by attribute. In the southwestern United States, much of the annual rainfall occurs over a few weeks during the monsoon season. You may have created a mosaic dataset of Landsat imagery over New Mexico. In this collection, you have multiple scenes for each date that cover the entire state, and those images were collected on different dates. You may want to see images taken during a certain season, or you may want to look at scenes that have minimal cloud cover. These are the kinds of selections you can make using Select By Attributes . In addition to making a selection based on an attribute, you can make selections by drawing around the scenes in question. The Rectangle tool is good for imagery since typically you don't work with scenes with irregular shapes. Once you've made the selection, you have a choice of how you want to display those scenes. You selected all of the Landsat scenes with minimal cloud cover from the months of July through August and you want to compare what the vegetation looks like for the rest of the year. After making the first selection, you can group the selected imagery and add it to the map. You can then switch the selection, which selects all of the images from January through June and September through December, and add this to the map as a different group. The Raster Item Explorer option can be used to filter items from a large collection of imagery in either a mosaic dataset or an image service and explore the properties of individual items, add them to a map or scene, and view and edit the processing applied to an item. To learn more, see Raster Item Explorer. MODIS collects imagery systematically, where the imagery is collected according to a defined periodicity and grid alignment; however, with a resolution of 250 meters, those pixels may be too coarse for some remote sensing questions. Conversely, when working with higher-resolution imagery, the revisit cycle is not systematic, and you may get imagery that overlaps in some areas. Deciding how to resolve conflicts from overlapping imagery is a component of working with collections of imagery. You can set up rules that apply to each layer as a whole, or you can apply rules to only the parts of the imagery that are overlapping. These rules are known as sort methods and are located on the Sort drop-down list. Some of the sort methods are particularly suited for having your collection of imagery be just a collection of imagery. You don't need to do any analysis; you just need to have it in some kind of logical order. In this case, the North-West and None methods are good options. Whenever there is overlap, choosing the North-West method resolves it by choosing the layer closest to the northwest corner of the boundary. The None method orders the images in the same order as the attribute table. Other sort methods can be used for zooming in and panning around your collection of imagery. For example, when you choose the Closest To Center method , you will be looking at the images closest to the center of your screen. As you zoom in to a feature, the selection updates automatically, so you see the imagery closest to the feature. The Seamline method is another option that's used for moving around your imagery. When you put your collection of imagery together, there are a couple of options for identifying seamlines. They can be based on the footprints of the imagery or the features within the imagery. However it is set up, when you choose this option, it generates the seamlines, ranks your images based on the distance to those seamlines, and chooses the closet imagery. The result is a smooth transition from one image to the next. A great deal of high-resolution imagery is taken from a viewing angle that is not directly overhead. There are advantages to this and one is that it allows you to measure the heights of buildings based on their shadows, creating a more natural-looking image. You can also see the sides of buildings rather than just the roofs. The drawback is that all of the angles are different, which can be disorienting as you pan from one image to another. Choose the Closest To Nadir method to select the imagery closest to being viewed from directly overhead. Assuming that all of your imagery is oblique, you end up with a less abrupt transition from one scene to the next if you have a lot of tall features, because the viewing angles will be fairly close together. Use specific attributes via the By Attribute method to select imagery with minimal cloud cover or that was taken near a certain time. You can then use the Lock Raster method to display only the images you select. These methods have the same effect as using the selection tools of the same names. If you have imagery over an area using multiple flight paths, you can use the Closest To Viewpoint method . These paths are stored in the metadata, and they allow you to view the imagery from a number of different angles, so you can see your imagery from all sides. After you've determined the method for ordering that you need, you can fine-tune your results. Use the Resolve Overlap button to access a set of mosaic operators. The First operator ensures that the images at the top of the list will be drawn first. Its counterpart is Last, which starts at the bottom of that same list. If you chose Closest To Nadir , it ranks all the layers based on their viewing angle and returns the layer with a value closest to 0 degrees. You can also work on the pixel level. There are different averaging and statistical approaches that you can take. The Minimum and Maximum operators take the lowest and highest valued pixel, respectively, of all the overlapping layers. Using this option means that you have no guarantee of looking at the pixels of just one image in the overlapping area but rather a combination of potential layers. Other options are Blend and Mean, which average the values of the pixels in question. While Mean is the standard averaging technique, Blend works by giving more weight to pixels closer to neighboring images to produce a smoother image. Using either of these operators means that you may not be looking at pixel values from any of your layers. The last option is the Sum operator, which adds the values of all the overlapping pixels. If you assume that most pixel values are relatively close to one another for each layer, this technique can be useful to visualize where you have the most layers. None—You will not compress your data at all. The advantage is that there is no data loss and it represents the highest possible quality. The drawback is that you will be transmitting your data in the slowest possible form. If you know your users have a reliable network connection, speed may not be an issue. JPEG—A compression ratio of 3:1 to 8:1, with little degradation of the image quality. When choosing the JPEG method, you can use the Quality setting to specify a value from 0 to 100. A value of 80 tends to retain image quality while providing approximately eight times the compression. LZ77—A lossless compression method that is ideal for scanned maps, classified imagery, and discrete data. LERC—Recommended for data with a large pixel depth, such as float, 32-bit, 16-bit, and 12-bit data. With this method, the quality value represents the maximum error value that is applicable per pixel (not an average for the image). This value is specified in the units of the mosaic dataset. For example, if the error is 10 centimeters and the mosaic dataset is in meters, enter 0.1. LERC compresses better (5 to 10 times) and faster (5 to 10 times) than LZ77 for float data and is better with integer data. With integer data and an error limit of 0.99 or less, LERC behaves as a lossless compression method. Processing templates are used to generate on-the-fly information layers. When you create a function chain, it's often built from a specific dataset, but you can also use a raster variable in place of that dataset so it can be applied to similar datasets. When you use that variable, the function chain is now referred to as a processing template. Vegetation indexes, elevation products (such as slope, aspect, and hillshade), and image classification results are just a few of the kinds of information layers you can derive using raster functions. You can add processing templates to a mosaic dataset or publish an image service with a processing template, allowing you to display your imagery as information layers. 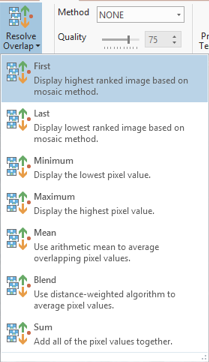 When you add a mosaic dataset to your map or connect to an image service, you have access to these information layers using the Processing Templates drop-down menu . When you select one of the layers, it immediately renders on the display. When working with mosaic datasets, you may eventually need to create a permanent output of your analysis. With the exception of geoprocessing tools, all of the analysis you do on a mosaic dataset or an image service happens in memory. The Export Data button opens the Copy Raster geoprocessing tool, which allows you to write to disk. If you do not want to download the source files from a mosaic dataset or image service, you can save the image that is displayed, or a part of it, using the Export Data option. In addition to saving your data to disk, you can use the Download Rasters button . This will open a pane where you can download the source data from an image service and mosaic layers. This accesses the service and pulls the actual files onto your machine, rather than reading the compressed version. The downloading capability is controlled by the administrator of the image service; therefore, not all image services allow you to download the source files. You can choose the desired source files using the attribute table or one of the selection tools. The source files may include raster datasets, LAS files, or LAS datasets. Once selected, any additional associated files will be included, such as metadata files or projection files. From the Select drop-down menu on the Data tab, you can draw your area of interest, make a selection based on an attribute, or select only the visible rasters. If you only want to download the source rasters, select Deselect Overviews from the Operations button . These options are also available from the layer's context menu in the Contents pane. When your selection is ready, use the Download Rasters button to proceed. Type a path or click Browse to specify a location on disk where the data will be downloaded, and check the items in the File List that you want to download. If the row check box is not checked, the item will not be downloaded. Optionally, you can choose to clip the data based on the extent of the data frame or any of the layers in the Contents pane. Use the Convert Raster check box to set the parameters for how the output is saved, including the file format and compression method. Check Add output to map if you want to display what has been downloaded.